[Editor's Note: The following was originally published at Schools Matter by Jim Horn. George N. Schmidt, Editor, Substance, January 15, 2010]. 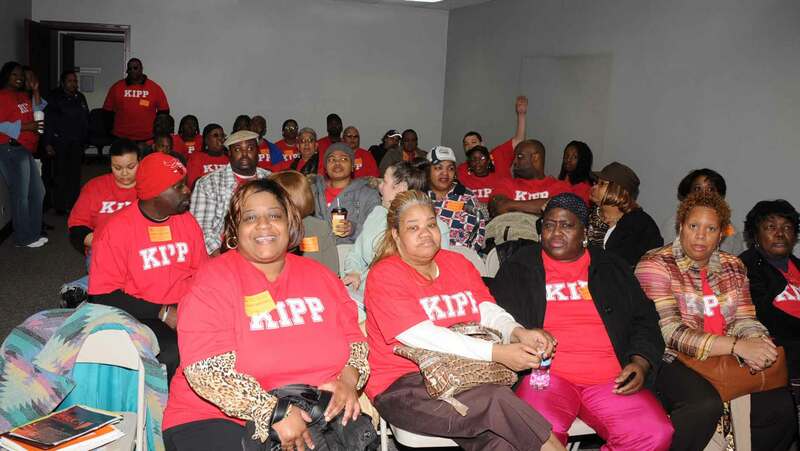 KIPP filled the buses in Chicago for the March 2008 Chicago Board of Education meeting to show the public (via the media) that there was widespread support for KIPP on Chicago's west side. 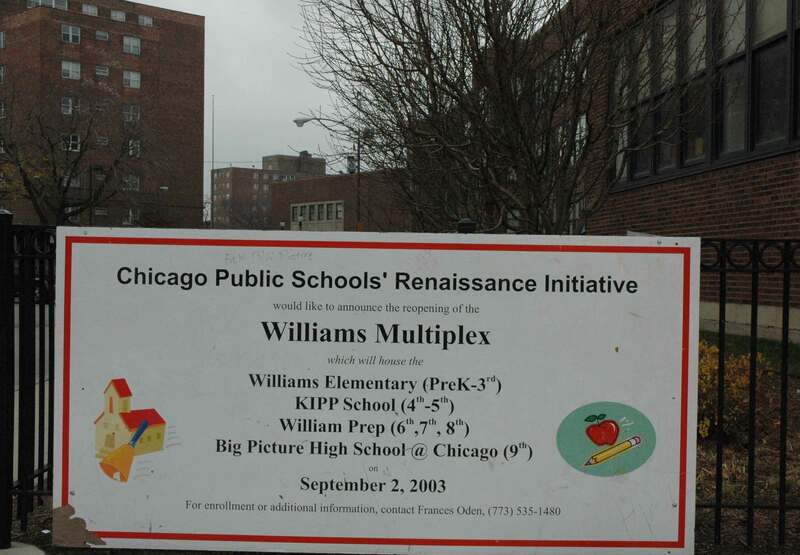 As usual, the narrative left out the fact that KIPP was promoting a segregated and militarized version of elementary schools, and that half the children who begin in the KIPP schools in Chicago are kicked out by fifth grade, a pattern that is repeated nationally. Substance photo by George N. Schmidt.There are a number of reasons why KIPP has become that shining schoolhouse on the hill that Gates, Broad, the Waltons, and the Fishers hold up (no pun intended) as the prime example of how to properly reintroduce total compliance behaviors among poor black and brown children across America. KIPP, in fact, has once again made segregation cool and "separate but equal" politically correct. KIPP has removed any excuses from our open acceptance of poverty and apartheid, and KIPP has made the attainment of proper behavior within segregated total compliance organizations the "civil rights issue for this generation." KIPP has also made failure invisible by focusing on the test scores of the half of the KIPPster 5th graders who make it to 8th grade, thus removing from sight the 50 percent of their KIPPster 5th grade low flyers who are washed out or pushed out before they get to 8th grade. KIPP, in fact, has made a civic virtue out of throwing away half their students. And through their ongoing consultation with Dr. Martin Seligman and his cadre of glassy-eyed zombie psychologists who teach corporate happiness through positive psychology mind control, KIPP founders Feinberg and Levin have hit upon a goldmine for themselves and a new generation of would-a-been Wall Street thieves, had Goldman Sachs not chosen this time in America to cash in on the economic catastrophe they created, thus leaving slim pickings for this generation of pupaic greed merchants. Many in this generation of "entrepreneurs" have turned social, i. e., they have focused on robbing and dismantling our public institutions whose loose democratic confederations don't stand a chance against the organized greed of the Oligarchy. Leaders of KIPP San Antonio, a branch of one of the most successful charter school programs in the country, are reeling after learning a former employee may have embezzled tens of thousands of dollars from the school district's accounts. According to KIPP board member Michele Brown, a member of the district's financial operations team who was working from home last Thursday stopped returning phone calls and e-mail after 12 p.m. The next morning, one of KIPP's financial institutions contacted officials to alert them to suspicious activity on an account. The employee didn't show up to work Friday and has not been located since. So far, officials have determined that a sum “in the low six figures” was missing. Brown declined to reveal the total amount because officials still are going through all their accounts. The employee was fired for not showing up to work. The Police Department's white-collar crimes division is investigating, and police say the former employee, whom KIPP and SAPD declined to name, is a suspect. Police Officer Matthew Porter said the investigation will take a minimum of 90 days. He said investigators are going through wire transfers and credit card charges. He said some of the activity may qualify as a federal offense. Mark Larson, head of KIPP San Antonio, said the missing money will not affect students or day-to-day operations at the district's two schools: KIPP Aspire Academy and KIPP University Prep. The district has an annual operating budget of about $5 million. “It was caught quickly, and we were able to limit the damage,” Larson said. According to KIPP board member Michele Brown, a member of the district's financial operation's team who was working from home last Thursday stopped returning phone calls and e-mail after 12 p.m. 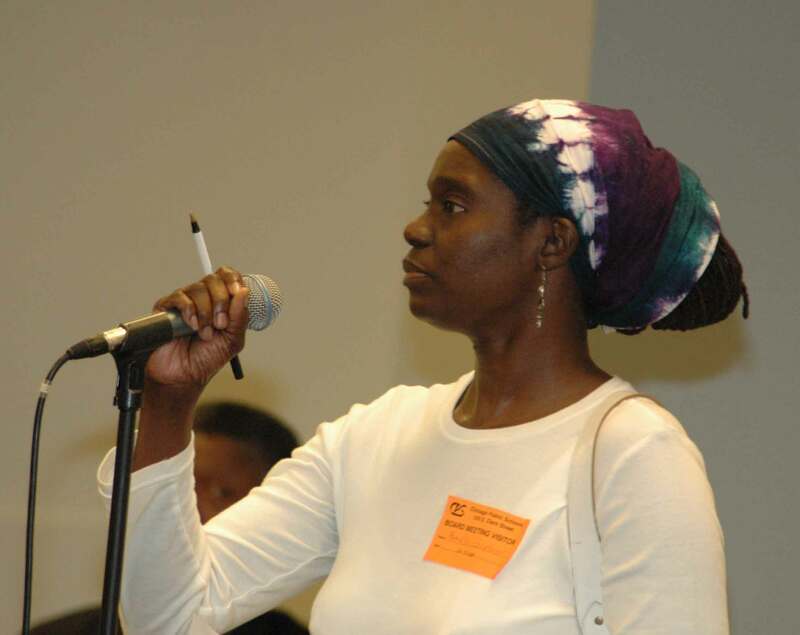 When former KIPP parent Pamela Gardner (above) tried to bring KIPP problems to the attention of the Chicago Board of Education at the Board's June 2007 meeting, Arne Duncan refused to follow up on the complaints, as he did with almost all criticisms of the burgeoning Chicago charter schools. Substance photo by George N. Schmidt.Police Officer Matthew Porter said the investigation will take a minimum of 90 days. He said investigators are going through wire transfers and credit card charges. He said some of the activity may qualify as a federal offense. KIPP schools are public charter schools that receive state funding but are free from many of the requirements of traditional public schools. The middle and high school serve a combined 500 students, and Larson has plans to expand, eventually operating 10 schools — four elementary, four middle and two high schools — by 2017, all serving inner-city kids. KIPP stands for the Knowledge is Power Program and operates 82 schools nationwide serving about 20,000 students. The program has seen success with students often tagged as the most challenging to educate — minority children who come from low-income neighborhoods. On average, from 2001 to 2008, students who were with KIPP for four years jumped from the 40th to the 82nd percentile in math and from the 32nd to the 60th percentile in reading on national tests. The success has made KIPP, which works mainly with disadvantaged children, a shining example in the charter school movement. KIPP University Prep opened this school year with a ninth-grade class and plans to add a class each year.